Apple on Thursday updated its Apple Store app for iOS with more comprehensive Touch ID support and a new two-factor authentication feature for securing users' Apple ID accounts. Apple Store version 3.3 is now protected by a two-step authentication process, an added layer of security that requires app users to enter both a password and verification code before making a purchase. To take advantage of the security feature, Apple ID account holders must have enabled two-step verification through the My Apple ID webpage. The option can be found under in the "Edit your Apple ID" menu under "Password and Security." Once activated, users will be asked to enter the password associated with their Apple ID, as well as a four-digit verification code sent by the system to a trusted device. 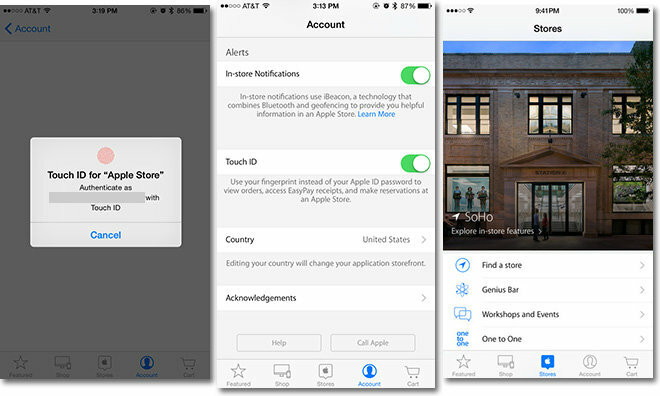 In addition to tighter control over purchases, Apple Store for iOS comes with an option that requires users confirm their identity via Touch ID before displaying order history and EasyPay receipts, or making reservations at brick-and-mortar Apple Stores. Prior to today's update, users had to manually enter an associated passcode to gain access to these in-app features. The Apple Watch app version does not require Touch ID authentication from a paired iPhone to view recent order history. The Apple Store iOS app is a free 22.3MB download from the iOS App Store.